Katherine came to Fieldstone Farm to help develop her social skills and overcome a fear of animals. She now has a great group of friends at the barn, loves the horses and is able to control her horse independently at a trot. The confidence and trust she has gained by working with the horses, has helped in all aspects of her life. “The girls are very good friends. When I see them laugh together and have fun it is such a pleasure. Katherine can’t wait for her Wednesday lessons. 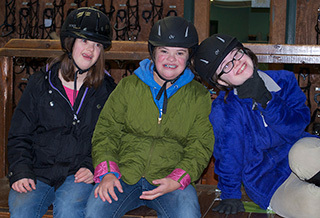 Riding is the highlight of her week,” says Cheryl, mother of Katherine, who has Down Syndrome.